Beyond Borders Film School is a 2D & 3D wildlife film school offering 25 day courses in Kruger National Park and mobile photographic/filming courses throughout South Africa. Check our website for the next course dates in 2016. Our 25 day courses are located in a Big 5 area, along the Olifant River, part of the famous Kruger National Park - a haven for plant, bird and animal life. We cover all the basics of Pre-Production, Production and Post Production with the latest technology (4K & 3D) in a fun, beautiful and peaceful environment. Lectures are presented by professional wildlife filmmakers in classrooms and out in the field. Highlight of the course: our students get to produce, film and edit their own broadcast-safe short wildlife film about a topic of their choice. If 25 days is a little too long for you, or if you have the travel bug, we also offer tailor made mobile photographic and filming courses throughout South Africa. You will learn the ropes of wildlife filmmaking while travelling South Africa with a professional filmmaker. And of course we also have our wildlife camera operator and creative video editing workshops which are just a few days long. Our mission is to train the next generation of wildlife filmmakers and offer our students an unforgettable experience. Wildlife conservation and environmental issues. We co-produce documentaries and series with other production companies such as Wildlife Conservation Channel. Promo video for guesthouses, lodges and wilderness activities in South Africa. 3D Productions and 3D Post-Productions. We are one of the pioneers in the 3D nature world and you can trust our knowledge and skills for your current and/or future production. Providing fixing services in French and in English throughout Southern Africa such as local transport, location scouting, accommodation, guides, filming permits, camera operators and video editors. Training the next generation of wildlife filmmakers. We run a 2D & 3D wildlife film school in the famous Kruger National Park where we offer 25 day courses about script writing, camera technology, camera techniques and video editing. Our students get the opportunity to produce, film and edit their own three-minute wildlife documentary with us about a topic of their choice. We also offer mobile photographic and filming courses for those who have the travelling bug and don’t want to stay 25 days in the same location. Photographic and filming safaris throughout Southern Africa with professional French and English speaking guides. If you have any project you would like to co-produce with us or if you need assistance for your current/future productions or if you are looking for a great institution to learn how to become an independent wildlife filmmaker contact us via email or telephone. 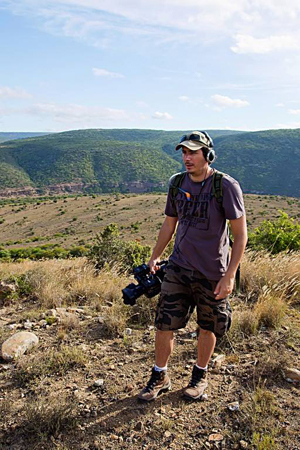 Sebastien is a French wildlife filmmaker based in South Africa near the Kruger National Park. With extensive knowledge and experience in Southern Africa as a wildlife camera operator (Sony Z1, Sony HD NX5, Sony 400, Sony F55, Canon X20, Canon 7D, Canon C300) -photographic/filming safari guide - fixer and video editor (FCP7 and Adobe Premier Pro) Seb now runs his own natural history production company and freelances as much as possible on the side. His experience started in Cape Town, South Africa where he operated as a wilderness tour guide, taking guided tours and photographic trips through South Africa, Namibia, Botswana, Lesotho and Swaziland. After a few years spent on the road, he had the opportunity to work on his first wildlife documentary for National Geographic, called “Swimming Scared” about Great White Sharks and Cape Fur Seals filmed in the notorious waters of False Bay. After even a short time working on this film, Seb finally found his true passion which took him to the Sabi Sands Game Reserve where he operated as a 2D/3D wildlife camera operator, editor and presenter for Wildearth.TV and Nat Geo Wild (Big Cat Week) on their live safaris. Being one of the pioneers in the 3D film industry, he was approached by world renowned filmmakers, Foster Brother Productions (link this to their production company listing on your website please), to work on Dragon 3D. This 1 hour film is about scuba diving with Nile Crocodiles in the Okavango Delta and Seb was responsible for all the online 3D editing. 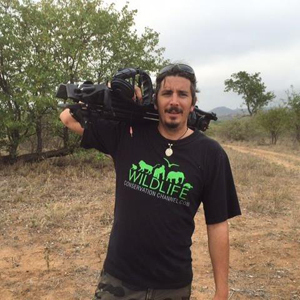 He is now an independent wildlife filmmaker through Beyond Borders Productions where he gets involved into as many wildlife documentaries and films as possible, marketing himself as a fixer, wildlife camera operator, DOP and video editor. His current project with Wildlife Conservation Channel is Volunteering For Wildlife: a series highlighting the hard work of volunteers in wildlife conservation around the world. Seb is the main camera operator on this series and directs all the post production side of it. 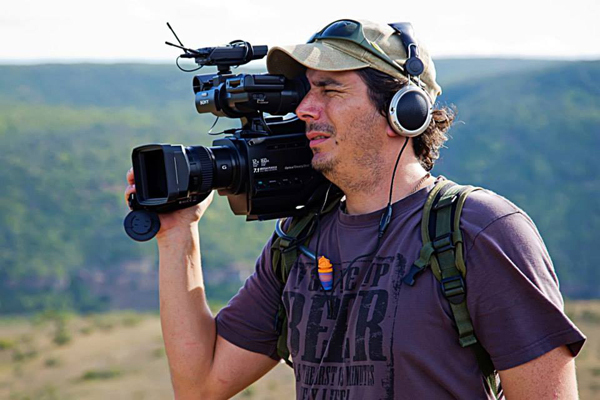 He is also the course director of Beyond Borders Wildlife Film School, a training institution based in the famous Kruger National Park where he offers 25 day courses about script writing, camera technology, camera techniques and video editing. The school also provides mobile photographic and filming courses throughout South Africa for those who have the travelling bug and don’t want to spend 25 days in the same location. His love and passion for all things wild and free can be seen in his projects, and his open mindedness and inventive thinking can only be a benefit to your current and future productions.